Maximize your retail income by using On Shelf to optimize your inventory levels. Don’t waste money on items that just sit on your shelves. Easily see which items are “hot” and those that are not. Now with the two most requested features: sync between your iPads and easily access items using the built-in barcode reader (third generation or later iPads only)! On Shelf allows you to quickly see what items you have in stock and what items need to be ordered. Invoices can be customized with your own image at the top. 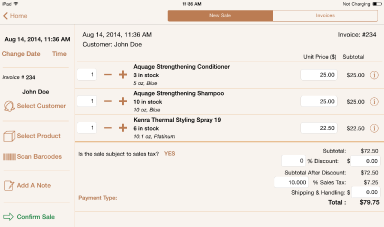 Sales can be entered quickly using the new barcode feature or by choosing products from a list. On Shelf has been designed to be as easy to use as possible, allowing you to spend less time managing your inventory and more time with your customers. The current trends report allows you to tell which products have the highest and the lowest sales. Unit sales and revenue comparisons can be made of sales on a daily, weekly or monthly basis. Or you can look at the products that generated the most revenue or estimated profit. 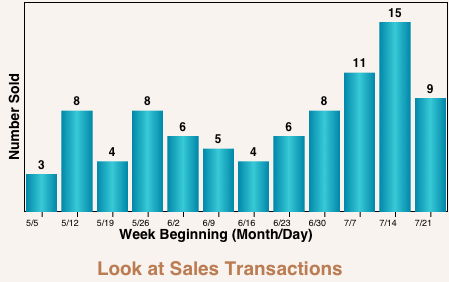 Select any product to see plots of the sales performance over the last 12 days, weeks or months. The sales analysis report screen shows you which products have been selling well and those that have not on a long term basis. Select any item to view its sales history or to adjust your stock levels from the same screen. 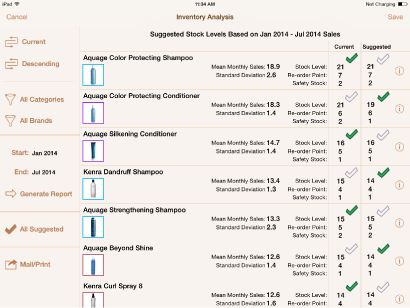 There is also an analyze inventory report that recommends inventory levels for each product. These levels are based on the sales data for the chosen time period. You can accept the recommendations or input your own. Red, yellow and green status lights let you quickly assess the inventory status of products in your current inventory. Easily identify products that need to be ordered. 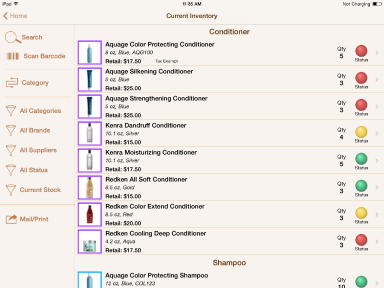 Sort your inventory by category, brand, size or color. Look at products in a specific category, brand, inventory status or search for a specific product. Or use the barcode function to quickly open the product description. 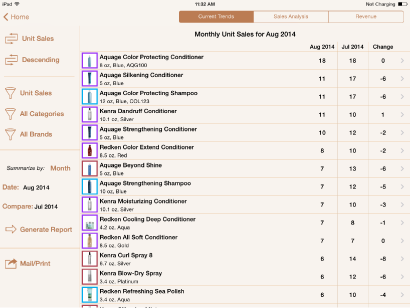 The current inventory screen summarizes the key details about each product you carry. Each product's image is framed by a color to designate it's category. You select the colors in settings. Select any item from the current inventory screen to see the product details and sales/order history. Graphs show the sales trends for each product on a weekly or a monthly basis. A glance tells you if demand for a product is increasing or decreasing. You can change the time period for the graphs to view the last 12 days, weeks, or months. 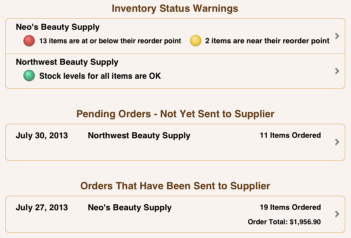 The inventory status for each supplier is summarized on the order screen. Place an order with a supplier at a touch of a button. The order can be printed or sent directly to your supplier. Not ready to send the order to your supplier? Save it as a pending order and come back to it later. Check an order into inventory quickly. Your inventory levels are automatically updated. Use the sales screen to log sales. It's up to you whether or not On Shelf calculates the sales totals. The sales screen can also be used to process a return and to print or email an invoice. Invoices are now saved and can be reviewed at your convenience. If you do not want to enter every sale, then the check inventory feature can be used to track sales. The customer history screen summarizes each customer's contact information. It also gives you quick access to their previous sales invoices and a summary of products that they have purchased. Products are sorted by quantity or date of purchase. 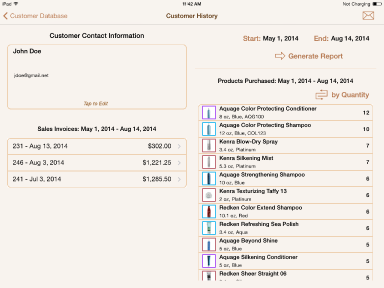 The sales invoices and product purchase history are shown for the dates that you select. A separate report can be accessed from the product details screen that gives you a list of the customers who have purchased a specific product within the selected time period. You may email them from this screen.